I have eight recessed lighting cans in my living room, arranged in two rows of four lights. As a lighting solution, these are truly unparalleled by any mounted or hanging fixture. Certainly no chandelier or hanging dome, no matter how elegant, could project as much light or create an illusion of size in a room quite like recessed lighting can. While I would not trade my living room light design for the world, there was one initial drawback, when they were first installed. Because of the white walls and LED bulbs, at night as I was trying to unwind, the brightness was almost oppressive. It only took a few nights before I decided to install a dimmer switch. Like most folks, electrical work scares me, but as I have done more and more, I have learned the old adage of electricians to be true: you need not be scared of electricity, but you must respect it. With that in mind, I set out to switch out my conventional light switch with a dimmer. Below, I have outlined what I learned. Hopefully, you will be able to put these lessons to good use as you work to create the perfect mood lighting in your own home. 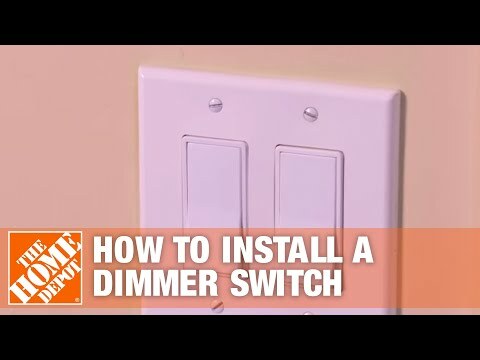 There are a couple of nuances to dimmer switches and so it is important to do your research before you head down to the local hardware store to make a purchase. First and foremost, not all dimmer switches work with all types of lights. If you have Compact Fluorescent bulbs in your fixtures, you will need to be sure to purchase a brand of switch that can support them. These tend to be newer model switches like this one from Lutron. You will also want to find out if the switch you are replacing is a single pole or three way switch. A single pole switch is when where the wired implement is only controlled from that switch. A three-way, on the other hand, is linked to a couple other switch locations, meaning you can turn the wired implement on and off at several different switches throughout your home. With regards to energy conservation, some dimmers use resistors. This means you are using the same electricity even when the lights are dimmed. Newer model switches will actually cut off the energy supply in order to create the dimming effect. You might also need a flashlight depending on where you are working since you will MOST CERTAINLY cut the power before you start playing with hot wires. Cut the Power: This needs to happen at the breaker. In no way, shape, or form does flicking the switch to the off position cut power to the wiring. Sometimes breaker boxes are mislabeled or not labeled at all, so you may need to make a few trips. This is where your voltage detector comes into play. Head downstairs or into the garage, try one breaker, head back and test the wires on your switch. Don’t touch anything until you are sure there is no power coming through the wires you will be working with. Remove the Old Switch: Once you have double checked that the power is in fact cut to the switch where your new dimmer will go, you can begin removing it. Unscrew the old switch and pull all the guts out so you can see everything in the box. You may have to cut the wires from the old switch, especially if it is old. Use your wire cutters, and snip the end of the wire as close to where it connects to the old switch as possible. Install: Most dimmer switch sets will come with a set of instructions that outline what wires go where. Green is ground, as per usual, but the other dimmer wires will all be black. These can be attached to either of the gold screws on the dimmer. There may be an extra screw if the dimmer can also accommodate a three-way switch. This extra screw may be labeled, but if not, double check the instructions or do a quick Google search for the model number switch you have purchased. This will ensure you are tying that third wire to the right place. To connect the wires to the screw, strip ¾ of an inch of casing from the wires and bend them into a U shaped curve. Hook these curves around the corresponding screws on the dimmer switch, then squeeze the ends closed, and drive the screws until it is firmly pinning the curved wire end in place. Finish Work: Once the wires are all connected to their corresponding screws, you can reattach the switch to the electrical box inside the cutout. Once it is secure, reinstall the switch plate, and you are good to go. Head back down to the basement, reset the breaker, and you are done! The next unwritten step entails hours spent moving the dimmer up and down, admiring your work, and trying to locate the sweet spot to compliment premium Sunday evening television.